Similar to the max standard modifier "Vertex Paint", the vertex paint tool has some advantages above this - especially the feature, that you can paint many vertices at once, and you can have a smooth paint border and stylus support. If you press shift or ctrl, you may pick the color from another or the same mesh.With shift, you pick an average color of all vertices inside the radius of the paint tool. This is a bit slower than the original vertex paint modifier. With ctrl, you pick the color in the center ot the radius. This tool is also available as a standalone modifier named "VertPaint". Channel: Vertex color channel. Channel 0 is the default vertex channel usually used for vertex color. But for special purposes, you can use all other mapping channels too. The VCol checkbox of the selection panel, which switches vertex color on and off, always refers to this channel. Filter R/G/B: This can filter the used vertex color to selected color channels, while other colors floating up the stack are left untouched. 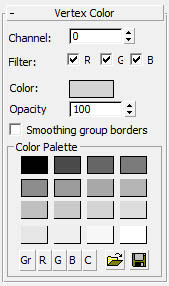 This is extremely useful if you have to work on color channels separately, e.g. if you are working on a realtime export scene, where landscape materials are determined by vertex color channels (green=grass, red=earth, blue=water). In the Vertex Rollout, there's an example described for this. Smoothing group borders: If you check this, Vertex paint is only applied to the faces with the same smoothing group the cursor center is on. Color Palette: A color palette like in the original Vertex Paint modifier. The color palette is saved and you can explicitly save it to a file. "Save" Icon: Saves the actual palette to a file. The file format is the same as the color clipboard files (*.ccb), except that 16 colors are saved instead of 12. Nevertheless you may load ccb files created from Vertex Paint into Color clipboard and vice versa, but in that case, only 12 colors are loaded. "Load" Icon: Loads a .ccb file into the current palette.